The Time Bandit was designed by Andy and Johnathan’s father, John Sr., and custom built for the Hillstrand fishing business. It has an 8 foot draft and is powered by two 425 horsepower Cummins engines with a cruising speed of 9 knots. THe Time Bandit carries 137 pots and has a capacity for 120,000 lbs of king crab. The boat includes such unusual amenities as queen-size beds, a four person sauna and a dishwasher. A bulbous bow was added in 2008 to reduce drag and help the boat ride above sea ice to avoid hull damage. And yes, the boat was named by John Senior after the 1981 movie Time Bandit whose wacky cast has always been a family favorite. 100% preshrunk cotton. Men s sizes S-XXL. 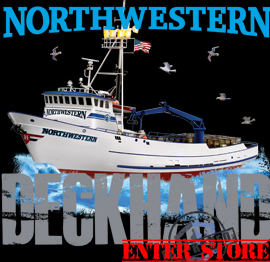 This product is exclusive to the Discovery Channel Store.If you’re looking for a job with a 100% injury rate, the Deadliest Catch ‘100% Injury Rate’ t-shirt was made just for you. Sport this t-shirt and you’re sure to catch some attention. T-shirt is pre-shrunk, 6 ounce 100% cotton. Double-needle stitched bottom and sleeve hems. This item is exclusive to the Discovery Channel Store. Be a true fan with this navy blue Pipe Down T-Shirt! The design features vintage lettering which reads Pipe Down Greenhorn. Tagless design for ultimate comfort. Pre-shrunk, 6.1 ounce 100% cotton. Double-needle stitched bottom and sleeve hems. Loose, classic fit, wears well on anyone. Imported. Cornelia Marie had a extensive rebuild in 1995 that added 21 feet to her overall length and increased her catch holding capacity to one of the highest for a crabber. Cornelia Marie now measures 128 feet long and has 180 pots for a capacity of 312,000 lbs of king crab. She is named after Cornelia Marie Devlin, a co-owner of the boat who handles much of the daily business of the boat’s operation. The Cornelia Marie’s twin Mitsubishi engines generate 630 horsepower for a top speed of around 10 knots but they’ve often been an engineer’s – and captain’s – nightmare. The late Capt. Phil Harris was captain and co-owner since 1990. In his last year, he skippered the boat through the 2009 king crab season and the first part of the 2010 opie season. 100% preshrunk cotton. Men s sizes S-XXL.